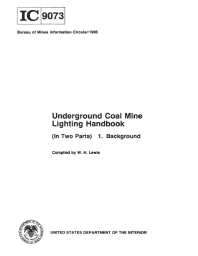 This Bureau of Mines report and its companion report (Information Circular 9074) have been prepared as a complete reference on underground coal mine lighting. This report discusses the fundamentals of light and its interrelationship with the visual process. The purpose of the report is to insure an understanding of the numerous complex and interrelated factors that must be considered to design and implement a mine lighting system that will satisfy human needs for good vision and comfort. Topics include history, objectives, and technical considerations of coal mine lighting; light physics; light and vision relationships; and disability and discomfort glare.